It started with John Rambo and later with the Lord of the Rings movie trilogy, when the characters of Rambo and Legolas fought off the enemy with a bow and arrow, then The Hunger Games star Katniss Everdeen and Hawkeye from the Avengers franchise sparked a renewed public interest in the sport. Without a doubt, the popularity of archery saw tremendous growth thanks to the success of these movie blockbusters. Families were suddenly taking archery lessons, as parents encouraged their children to try a new sport and be just like their favorite cinematic hero. And while some may see archery as a fun hobby, there is much more to it than meets the eye. Records trace the first bow and arrow back as far as 50,000 BC. It was traditionally used for hunting, but is now a popular sporting contest, and it’s even a competitive Olympic sport. Though often perceived as a stationary sport, competitive archers require a significant amount of strength, endurance and focus to perform well, making it an ideal sport to help keep you healthy and fit. Once you get into archery, you’re going to hear people throwing out terms such as “Olympic,” “traditional,” “3-D archery,” etc. They’re talking about the different styles of archery. And if you’re going to get into the game, you’ve got to know your style. Competitors typically shoot from 18-90 meters, which is about the length of a rugby field. All Olympic recurve bows are going to be take down bows. That means the limbs can be removed from the riser. This is a precision-shooting style practiced primarily by compound bow shooters who participate in tournament competitions. They primarily shoot at paper target faces that range in sizes of 20cm to 122cm. The tournaments might be indoors, or they might be outdoors. Target compounds tend to be long – 36-40 inches from axle to axle is common – and they usually have brace heights anywhere from 7-9 inches. Both qualities make these bows very forgiving and friendly in an archer’s hands. Arrows are built solely with stability and accuracy in mind. Indoor arrows tend to have a large diameter and they’re heavy, while outdoor arrows have a smaller diameter and are aerodynamic, for cutting through the wind at long range. Compound target archers use stabilizers of all lengths, and their sights often feature scopes with magnifying lenses. Tournament classifications dictate what equipment is allowed for some archers. In 3-D archery, archers shoot at 3-dimensional, foam animal targets. The targets are placed at various distances from the shooting stake, which means archers must shoot at ever-changing yardages over the course of a shoot. Sometimes the distances are marked, but often, the archers have to judge the yardages for themselves. Archers shoot every kind of bow in 3-D archery, so you’re just as likely to see someone shooting a target compound as you are a traditional longbow on the 3-D range. Arrow speed is an important consideration for 3-D archers, since faster arrows can make up for errors in judging distances. This is an all-encompassing category that refers to anyone and everyone who participates in archery for the sheer enjoyment of shooting a bow and arrow. Recreational archers shoot all kinds of bows, in all kinds of settings, at all kinds of targets. If you shoot a bow and arrow just because you love it, then you’re a recreational archer. Bow hunters use compounds, recurves, longbows and crossbows, all with the goal of taking game. Their gear is going to be camouflaged or of neutral color, as compared to the shiny, bright-colored equipment used by target archers. Bow hunting equipment also tends to be beefier than target gear. Bow hunters must be concerned about their arrows punching through thick skin, fur and bone, so their bows tend to have heavier draw weights and their arrows generally weigh more than those used in target archery. In bow hunting, you’ll see bow-mounted arrow quivers, along with various pieces of gear attached to the string and/or limbs aimed at making the bow quieter. Stabilizers and sights tend to be short, compact and sturdy for carrying long distances, often through thick cover. Traditional archers lean toward the equipment that imitates what was used long before the modern era. They shoot recurve and longbows at all types of targets, including stumps. Many of the recurves are going to be one-piece bows, but take downs also are acceptable. What separates traditional archery from Olympic recurve is the bows are stripped down. Sights generally aren’t used at all, and stabilizers, if used, are short and simple. Rests and plungers are used by some traditional archers, although many shoot their arrows right off the shelf of the bow. Traditional archers usually are the only archers who shoot wooden arrows, although they also shoot carbon and aluminium shafts as well. Improved hand-eye coordination and balance: Archery trains the hands to work together while performing different tasks, aiming and firing the arrow based on input from your eyes. Coordination improves with repetition and practice. Balance is also paramount to success in archery, as the body must be held still while aiming and making a shot. Over time, the core becomes better at gaining control of the body’s balance and helps with more accurate shooting. Hand and finger flexibility:Finger and hand strength increase in archery. They also become more flexible because they are fully in use while aiming at the target. Strength building:The arms, core, hands, chest and shoulders are all used when practicing a proper draw. Like lifting weights, the tension on these muscle groups is typically maintained for several seconds before the archer releases the string to fire an arrow. With repetition, the act of drawing and firing a bow leads to muscle development in most of the major muscle groups of the upper body. Increased patience: Most people can use a lesson in patience, and archery helps with that. This is a sport that requires patience because it is not about speed but about precision – and precision can take time. Increased focus:Archers need to tune out all distractions, focus on their form, and release the bowstring consistently. 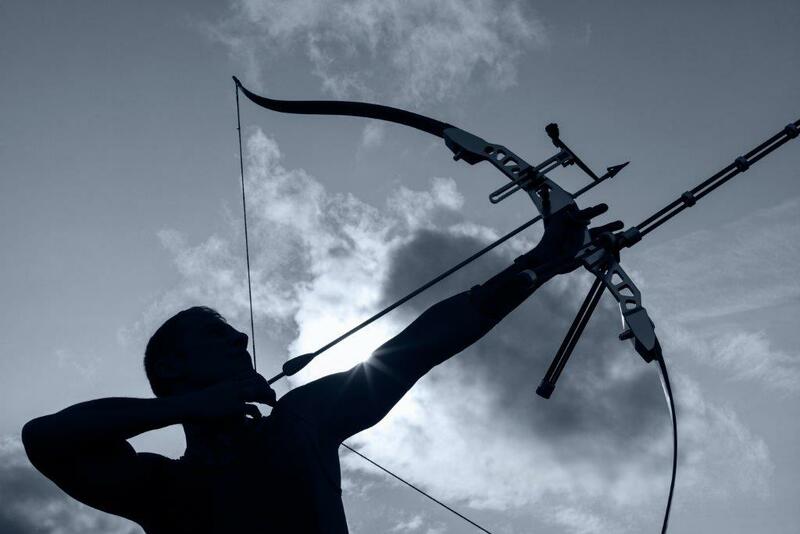 The concentration practiced during archery can help with coping in high-pressure situations, and in day-to-day life as well. Improves confidence:In archery, competition can be against others or against oneself. Because of this, results are measurable and improvement in one’s form and technique results in a boost in self-esteem and self-confidence. Is a social sport: People of any age and from many walks of life enjoy archery, almost every age group can participate, competitors from the age of 6 all the way into their 80’s are shooting. It also teaches the benefits of teamwork in some cases with some competitions involving groups of people. Is a form of exercise:At competition level, archers walk the equivalent of 8 kilometers, carrying heavy loads during a day’s event, in addition, some say drawing a bow burns about 140 calories per half-hour, the same as walking at a brisk, 5.6 kph pace. Relaxation:Releasing an arrow, watching it fly, and having it hit a target can relieve stress. The act of focusing while building strength and confidence is overall a satisfying and relaxing experience. Open to all: Archery can be done by both able-bodied and disabled people. People with the most severe disabilities and even the blind, use special tactile equipment and can join in – making this a great family sport! As with any new sport and hobby, there are some tips that will help. Speak to a local club or get additional information on archery at aboutarchery.com. About Archery will also have open days and training days where they will teach and showcase the different styles and options available. Go to your nearest archery store or visit magnumarchery.co.za to see which options and gear is available to you. Magnum Archery is owned and run by Seppie Cilliers. Seppie has an extensive knowledge on any archery inquiry you might have. Facilitating all Magnum Archery Academy courses, you are sure to learn something from him. Is This Insane Parkour Obstacle Course Actually The 10th Circle Of Hell?